This morning, after a brief but heavy rain shower, the dogs and I were walking down the lane towards the bottom of the mountain and what do we see? A deer, a doe to be specific, standing in the middle of the lane. She looks at us. We look at her. She twitches her tail, which turns out to be too much for the dogs. Dog stands up on his hind legs, as tall as me, balancing against the leash I’m holding. Doe twitches her tail more. Baby Dog starts to bark. That does it. Doe takes off into the woods and while I’m trying to settle the dogs, another doe crosses the lane behind the first, followed by three (count-‘em) three fawns of the exact same size on her heels, followed by two more doe and another fawn and I think another doe and maybe even another fawn. I have a whole herd of mamas and young ‘uns in front of me and two crazed dogs by my side. I can tell it’s going to be another one of those days. So my daily morning doe is actually multiple does, though it’s odd this is the first time I’ve seen them all together, not to mention what appears to be triplet fawns. It’s not uncommon for one or two of the does to wander through my back woods in an evening, setting Baby Dog to barking. She’s convinced the deer are attacking the cabin and are Dangerous Creatures. I’ve tried, unsuccessfully, to disabuse her of that notion. I’ve come to the conclusion that Baby Dog thinks everything is a Dangerous Creature. I think I'm ready for a weekend! 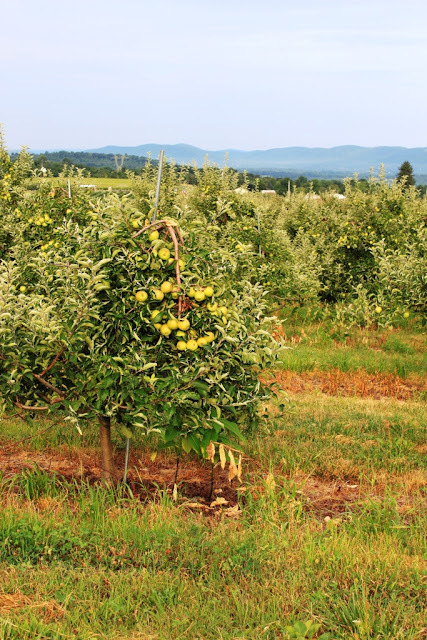 Fall’s apples aren’t ripe yet, but they are already large and heavy on the trees. It won’t be long before the first of the season are on my table. I haven’t had much luck this week taking photos in the forest on Roundtop. Everything looks the same to me—lots of very dense greenery and the occasional vertical browns of the tree trunks. I need a few of those leaves to fall or thin out to open up the space a bit, both to let in more light and also to reveal the rest of the landscape. The local birds aren’t cooperating either this week. They are all skittish and the strong light makes silhouettes even of the bright bluebirds. So for the moment, I am taking my morning photos as I’m heading down off the mountain. Some of my difficulty is due to the ever-shortening days. Early mornings in a deep forest are already much darker than they were a month ago. For a few moments on this cloudy morning, I thought about taking my headlamp when I walked the dogs. I didn’t have to do that today, though I will have to pretty soon, at least until I get out onto the lane where the sky is visible. Wouldn’t you think after all the years I have lived that the date when I have to start using a headlamp in the mornings would be ingrained in my memory? I can remember Christmas and New Year’s, birthdays and anniversaries. Why can’t I remember when I need to start wearing the headlamp? I’m always surprised at how much I forget from year to year. Of course, that does make every year a new one, in many ways, which isn’t a bad thing at all. But I still think I should remember the date when I’ll need that headlamp. Will there be a stream left for August's camp? When Monday night’s storms dropped half an inch of rain on Roundtop and nearly 2.5” of rain in Harrisburg, I was hoping the weather would raise the level of the little stream where I meet with the kids from camp. That didn’t happen, unless the level of the stream would have been even lower than it was on Tuesday. The stream, the North Branch of Beaver Creek, is barely flowing. I’ve seen it this low, rarely, at the end of a dry August, but never at the end of July. I have two more weeks of camp with the kids, and I don’t know if there will be any stream left by then. Somehow, I don’t think an empty stream bed, or a nearly empty stream bed, devoid of life because the raccoons have feasted on the frogs, minnows and salamanders, will be nearly as interesting or as much fun for the kids. The low water of yesterday contributed, I believe, to the kids finally catching the two biggest crayfish of the summer. I (and the kids) have seen these crayfish all summer, but they haven’t been able to catch them. That’s mostly because the crayfish hang out in the middle and deepest part of the little pool where we meet. Their little arms and the minnow net haven’t been able to reach into there—until yesterday. Both of the biggest whoppers were caught and spent the afternoon in my bucket, producing oohs and ahhs from the kids. All the “prisoners” were safely released at the end of the day. The kids also are catching more minnows than they did at the beginning of the summer, too. The lower water facilitates that as well, but that’s not the only reason. In the early part of the summer some of the minnows were so small they could slip through the tiny holes of the minnow net. The minnows have grown some since then, and fewer of them are that small anymore. The ever-obliging wood tortoise was captured again, to the delight of all. The tortoise is such a mellow creature, not in the least bit aggressive or even fearful. Even after we release it, the kids can watch it swim in the pool, stick its head up and watch us back. The worst of this latest heat wave is just about over, though the effects aren’t moving out of town just yet. It’s so dry that grass cracks and breaks underfoot. The humidity that wilted plants and people alike is still here, too. The air is so soupy with moisture that a fish could breathe out of water, and I think I could breathe better if I was a fish. With a little luck before today is over, even the humidity might get tossed out of the area. The only downside is that the actual eviction is likely to bring severe storms with it. That part I could do without. I’ve lived on the mountain for 20 years now, and Friday was the first time I actually saw a temperature reading of 100 here. I’ve seen temperatures that high down off the mountain occasionally. Friday’s official temperature in Harrisburg was 103. That’s at least 20 degrees higher than I like it. The extreme weather affects the forest residents, too, of course. Deer are even less likely to bolt than usual. They try to graze on brittle grass up on the ski slopes. They stand out in the open, trying to catch a virtually nonexistent breeze, and watch the cars go by. At least the ponds still have enough water in them for the residents. I’ve seen deer standing in the water, up past their knees, this week. I won’t know how the stream at the base of the mountain is doing until tomorrow, when I have another group of kids in camp. I’ve walked right up on several rabbits this weekend. Or perhaps it was the same one several time over. Who can be sure about that? Even those shy creatures don’t want to run until the last possible second. The chickens lounge underneath the coop, scooping out round areas of dirt to plop into. We will all be glad when the heat is over. Weather like this is the number one reason why I’m not a summer person. Maybe I should live in Alaska or the Yukon. The summers there might be cool enough to suit me. I’m a lot perkier when the weather is cooler. Was as icy and cold as January. 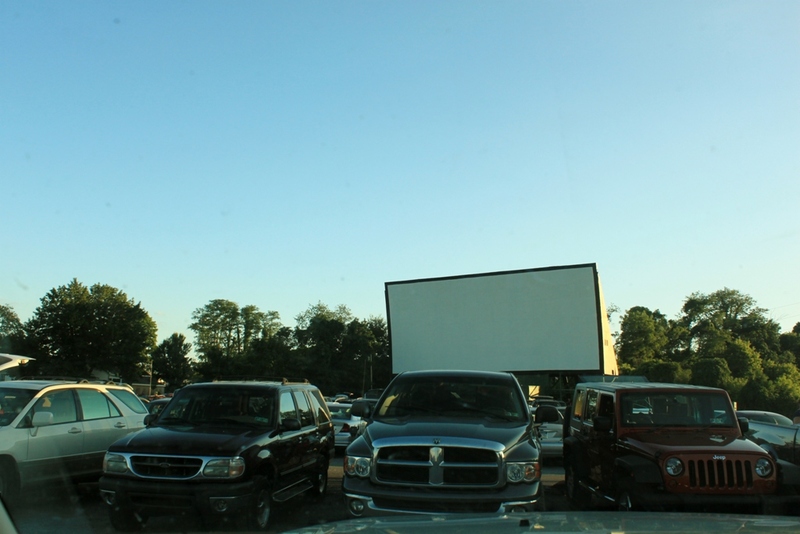 Last night I went to the local drive-in theater to see the new (and last!) Harry Potter movie. This one is Haar's Drive-in near Dillsburg, PA. 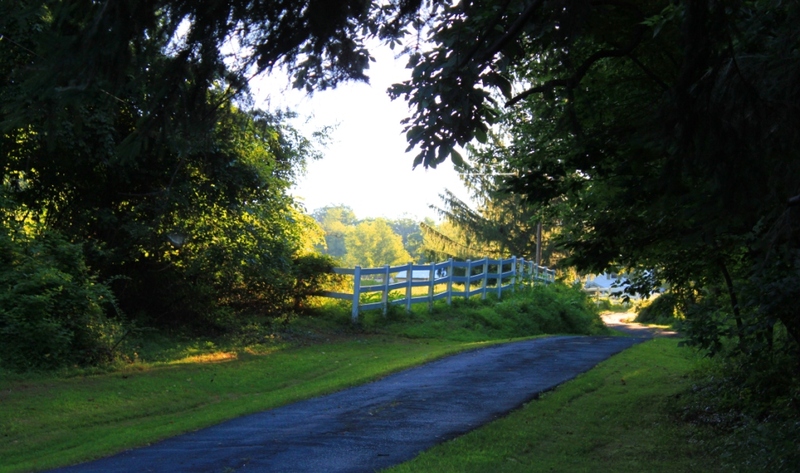 It was a perfect summer evening, low humidity, not too hot. Once it got dark and the movie started, I could see the stars all around. That didn't last too long because the full moon soon rose in the cloudless sky and hid all but the brightest stars. I think blockbuster movies are meant to be seen outdoors at a drive-in. There aren't many around anymore. They take up a lot of land. This one has been around all my life. At the back of the theater grounds is a building where the owners hold a weekly auction. Back in the day, the building held a roller-skating rink. My parents met there not long after dad returned from World War II. I've watched movies here since I came with my parents, sometimes wearing pajamas because it would be late until we got home. As I got older, I joined the bigger kids running around the lot on the swings, an impromptu little tribe of sudden friends. That was more than 50 years ago now. I noticed that things haven't changed very much. 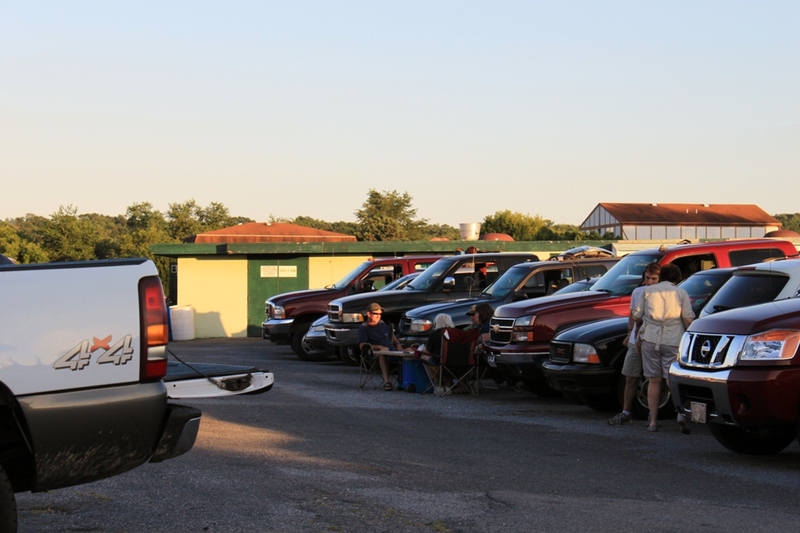 The drive-in was packed last night. It usually is, especially on a night with fine weather and a big movie on the marquee. The kids still run around, the parents sit outside before the movie and read or chat or play cards. Trucks and bigger cars face backwards so people can put their lawn chairs in the back and watch the movie. Teenage girls come 3 or 4 to a car. Couples--young, married and elderly--show up. Families bring kids in pajamas, with flashlights. I saw the full moon rise, the stars in the sky, a shooting star zip overhead--and the movie was good too. A perfect evening! 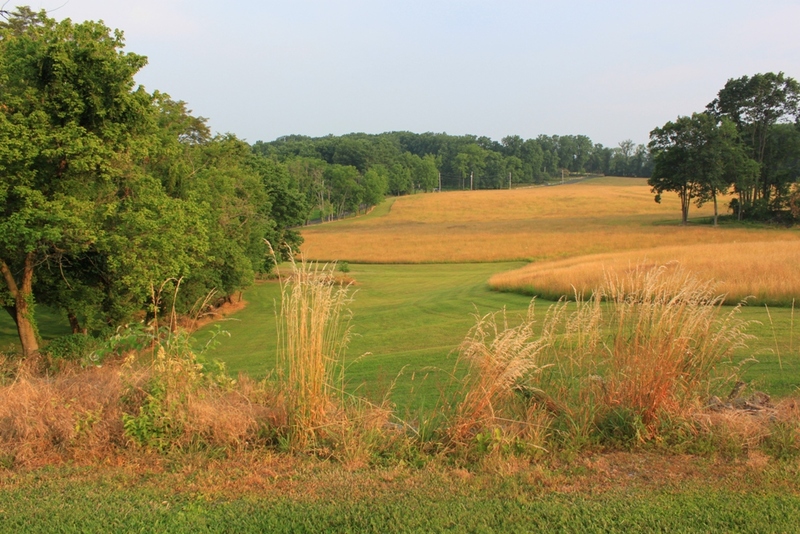 I have posted photos of this view before in winter and in fall--it's the western view from my cabin--though I'm not sure I've ever posted the view in summer. Today I am rectifying that oversight. The cleared area in the foreground is an abandoned ski slope. Since the slope faces west, it didn't hold snow well--got too much sun even in winter. So Roundtop finally gave up trying to keep snow on it. But they still mow the old slope a couple of times each summer, to make access to the snowmaking pond down at the bottom of the mountain easier. This morning the humidity was low and the sky clear. The days are already getting noticeably shorter. 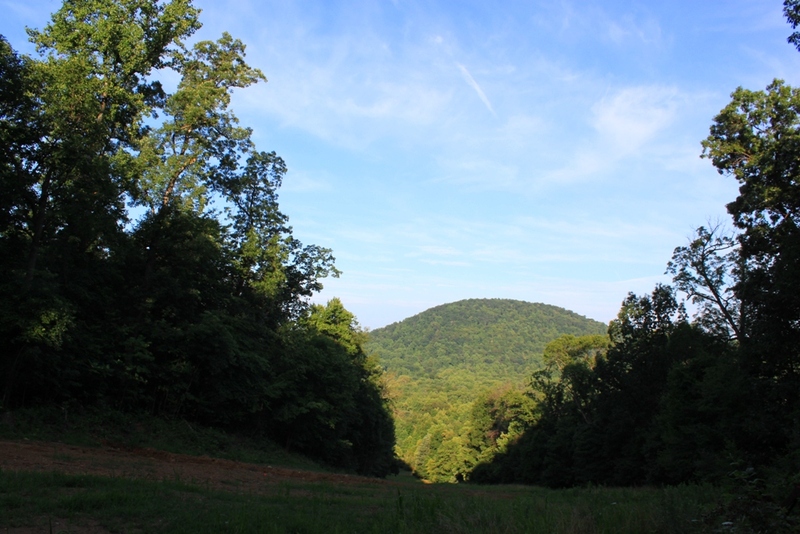 The shadows are long at 7:15 in the morning, so while the eastern face of Nell's Hill was sunlit, the western side of Roundtop Mountain wasn't. I liked the effect of the dark foreground and the mountain in the distance. This morning, Dog, Baby Dog and I all saw a fox and a deer--not together. The excitement that generated in two large dogs is almost more than I can handle. Dog was more interested in the fox than Baby Dog was. I'm not sure she knew what it was until we got close enough for her to catch its scent. All three of us saw the deer at the same time. It's that same doe that I see once or twice each day. It's well-habituated to humans and tends not to bolt the instant she sees one of us. Of course, that's too much for the dogs, to have a deer standing in front of them twitching her tail. My arm muscles are still hurting from trying to hold them back. It is and it feels like midsummer here on the mountain. Some of the wildflowers and weeds are already going to seed. Last night I heard a few cicadas for the first time this year--it's not going to be one of their big years, which is fine by me. When they are out in force, people can't hold a conversation outside without raising their voices. For the moment, the weather is giving me a respite from heat and humidity. The morning was cool, the night before pleasant for sleeping with the windows wide open. All of summer's days should be like this, with a few, occasional breaks for needed rain. I can only dream of that and try to keep these days in mind once the heat and humidity return. 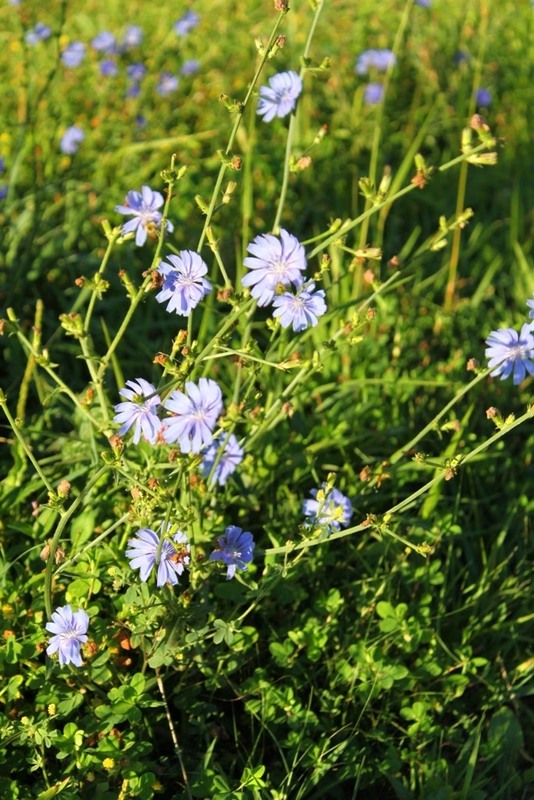 Nearly everywhere I look right now I find a blooming chicory plant, usually dozens of the beautiful blue flower. 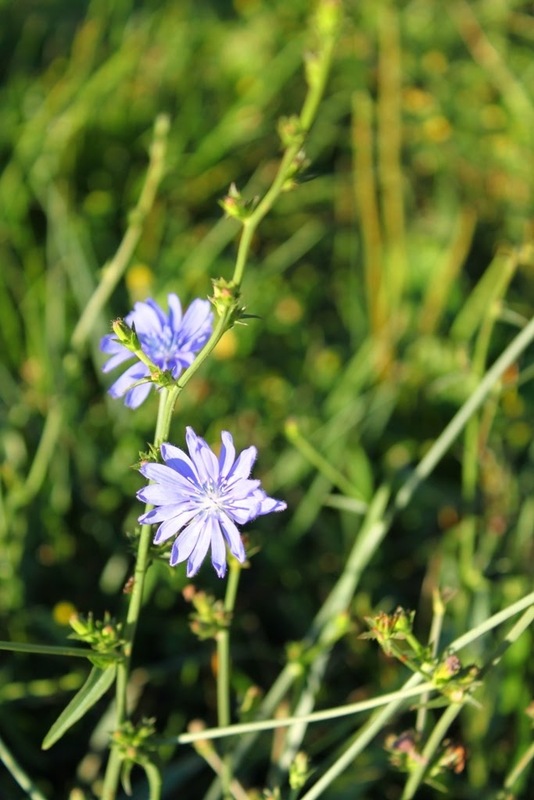 Chicory is in that category of plant that some people consider a weed, but those are often the same people who think anything they didn’t plant in a garden is a weed. I come from a different stripe, one that appreciates a flower that is as independent as the chicory, able to grow in nearly any soil and as beautiful as the summer sky on a cloudless day. This year chicory seems particularly profuse at Roundtop, in that cycle of life that waxes and wanes, some years in abundance and other times not quite so much. As the sun rises, the flowers turn towards it, the blue petals greeting the sun after the night’s darkness. They seem greedy for the day’s new light, but during the brightest part of the day, the flowers will often close, as though the sun grows too strong for them. When the weather is cloudy or gloomy, the flowers stay out all day, brightening a dull day with that intense shade of blue. Yesterday I was worried about the weather for my session of adventure camp. The forecast was for 95 degrees and very high humidity, a combination that didn’t sound auspicious. Hot weather is not my forte, and I live in fear that my camp excursions will fall on the hottest day of the summer or at least the week. Fortunately, the forecast was wrong, and instead I had weather in the upper 80’s, lower than predicted humidity and a constant, if warm, breeze. It was hot but not remotely unbearable. The weather has also been dry here, and that is showing up in the amount of water running through the creek where the kids get to terrorize look for critters. So far, the lessened amount of water isn’t impacting what or how much they find, but if the lack of rain continues, and it’s supposed to for at least the next week, it won’t be long before that happens. Yesterday, the kids found a bucketful of crayfish, a hellgrammite (or helgramite if you prefer), a long-tailed salamander and a small bullfrog. They missed catching a second frog, a toad and a tiny snake that disappeared faster than you could say “snake!” That little thing was taking no chances at being scooped up by a dozen kids, that’s for sure. Hellgrammites are ugly as sin. 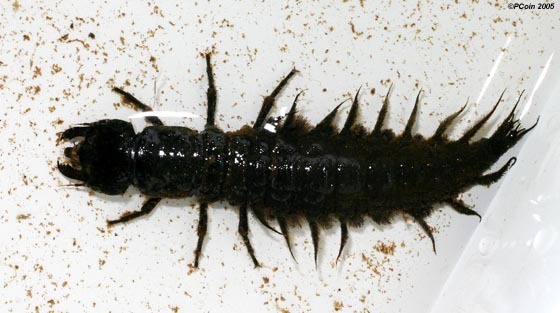 They are an aquatic insect, the larval form of the dobsonfly. This one was about an inch long. They look a bit like a centipede. The kids were suitably impressed with its overall ugliness. I don’t know much about them, except that as bass bait virtually nothing is better. I can remember using artificial hellgrammites when I would go fishing with my dad when I was a child. Even the rubbery version was ugly. Last night distant lightning kept me awake for about half of the night. The storm never got close enough to the cabin for me to hear the thunder, even in the near-perfect silence of a still summer forest. Because I couldn’t hear the thunder, I know the storm was at least 10 miles away. That distance didn’t stop the sharp and very bright lightning flashes from lighting up the forest, though. I could have closed the curtains on the big picture windows that line the entire north wall of my bedroom, but the only time I do that (and then reluctantly) is on very cold winter nights, those that fall well below zero. If I didn’t want to see the forest at all hours of the day and night, I wouldn’t live here. And despite the occasional lack of sleep, watching the lightning skitter through the trees and turn the forest momentarily as bright as noontime at 3 a.m. is a pleasure in itself, something I am lucky to be able to experience. I am well aware that my experience of living in the woods isn’t the norm in this modern world, especially here in the eastern U.S. So I want to soak up as much of it as I can, take it into me like my next breath, so that the woods and I become as nearly close to one as possible. I have always felt the forest to be a living thing of its own—all its parts, all the bugs and different plants and trees and animals contributing to a single one thing, the forest. To me, the forest is a holy place, a wholly living and breathing entity. It’s a pure place, in a world made impure, often, by we humans who inhabit it. Here is where I can experience life as perfectly as the earth created it. Why would I close the curtains? Today’s photo is of the flower of the black cohosh, a name that is meaningless when you look at the flowers. 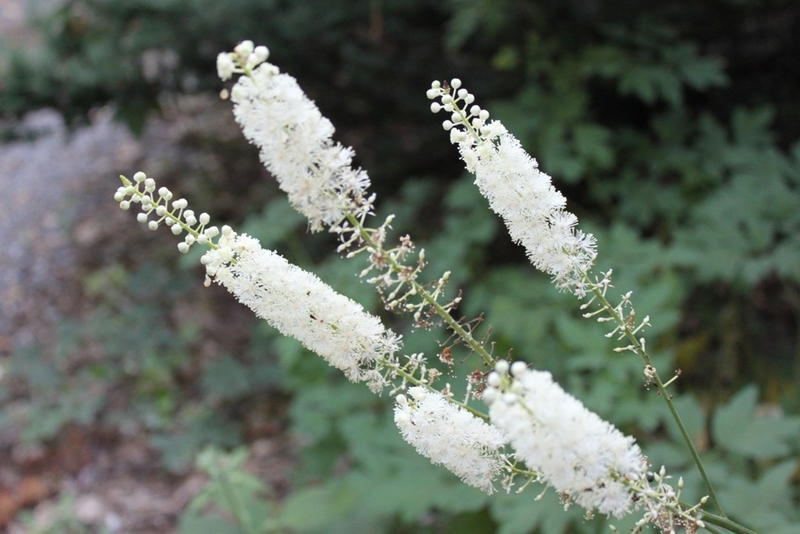 Black cohosh has more common names than you could shake a stick at. 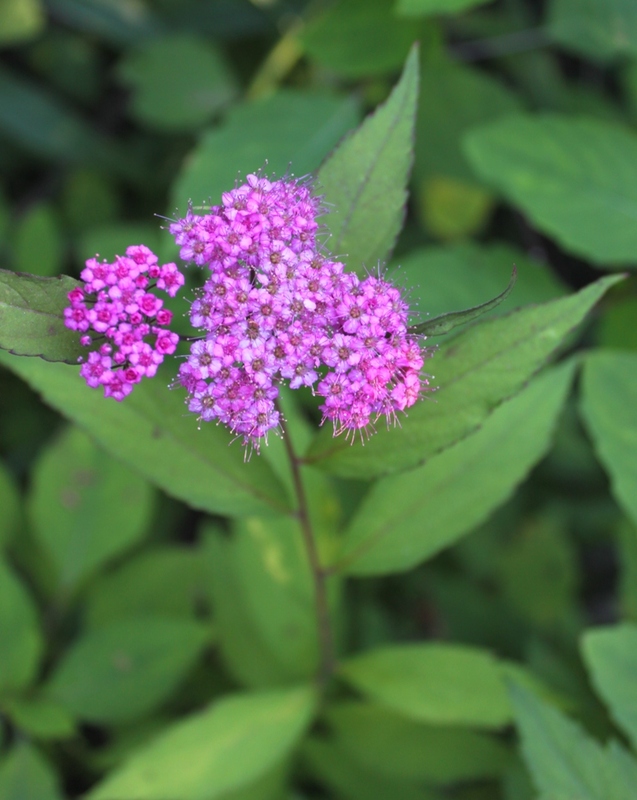 Black snakeroot, bugbane, bugwort, rattleroot, rattleweed and squawroot are just a few. This year I have the plant all over the place, including many plants along the edge of my driveway, where I took this photo. 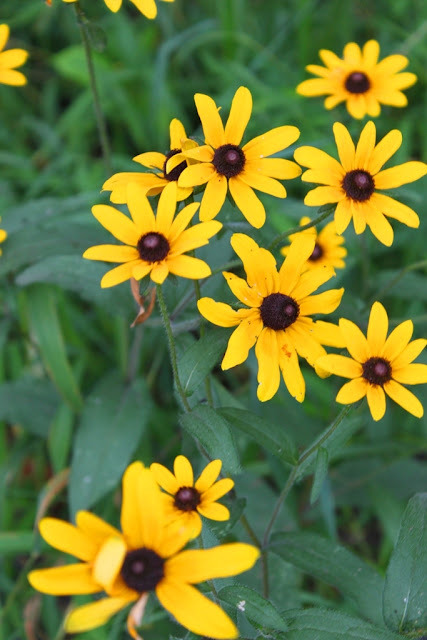 It is native to North America and is one of those alleged to cure a multitude of ills. It is considered to be a plant suited to mainly women’s ills, mostly for menopause symptoms, but also for some more general uses, often for arthritis. Since there’s nothing black about the flower or the leaves, I’m guessing the root, which is what is used for medicinal purposes, must be black, though I’ve never pulled one up out of the ground to check. 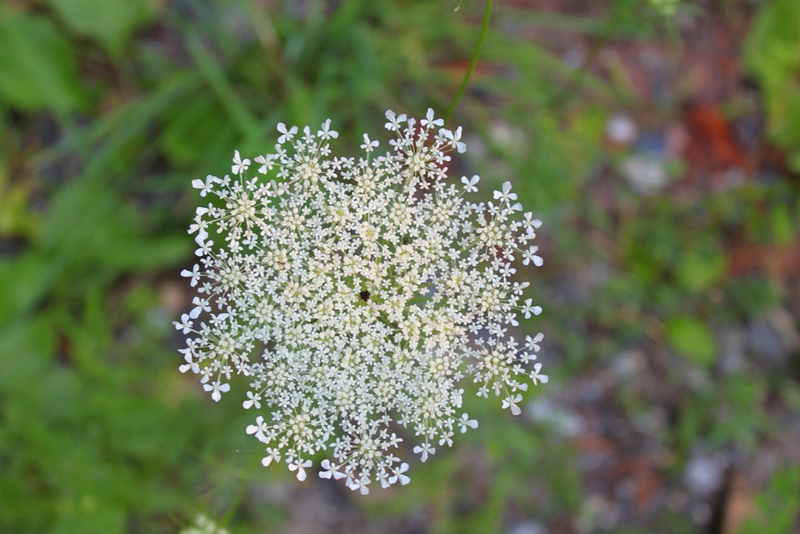 Personally, I prefer the name rattleweed since the flower resembles a rattlesnake’s tail more than anything. The names bugbane and bugwort are accurate, too. Bugs don’t like this plant for some reason. I just like the way the flowers look. The flowers are not the common shape of flowers, and each rattle is about 4-6 inches long, so it’s a showy plant too. And this year there are plenty of them around to see. It feels as though the dog days of August have arrived in early July this year. It’s hot, hazy and humid, in other words. Today the temperature has finally stopped flirting with 90 degrees. It’s there already. Perhaps that’s the reason Dog, Baby Dog and I are encountering quite a bit of wildlife in the early mornings. This morning was a good example. One of the deer was just behind the back door, snorting at something. That set the chickens to squawking in alarm, and then soon followed both dogs, first with a chorus of barking and then full-throated howling. Meanwhile, I was looking to see if there was a predator, maybe a fox, to blame for all this pre-6 a.m. noise. I never did find any sign of anything else, which is why I now think the deer was snorting at me. Amazing how much chaos can be caused by simply stepping out my door. The wildlife activity doesn’t last too long. By 9 a.m. the woods are quiet again. Even the rabbits aren’t out and about, though sometimes the young groundhogs ignore the heat and munch on some nice greenery. Humidity is the main reason I’m not a fan of summer. I might be able to ignore the heat if the humidity was low, but higher temperatures and high humidity go together in this part of the world. My photo today is of wild butterfly weed, also know as ironweed and probably about 12 other names. There seems to be an especially robust crop of it this year, which makes the current lack of butterflies a bit mysterious. It’s not that butterflies are nonexistent this year. They simply aren’t nearly as common as they were last year when they were numerous. But it’s still early yet. Butterflies, especially the swallowtails, seem more common in August and September anyway, though in a good year (as 2010 was) I should be finding more now than I am. July is not the best time to go birdwatching. In fact, July may be the worst month of the year for birdwatching if you are interested in finding new species for a year list. However, my birdwatching this year has been sadly limited, and many common species have not yet found their way onto my 2011 list. 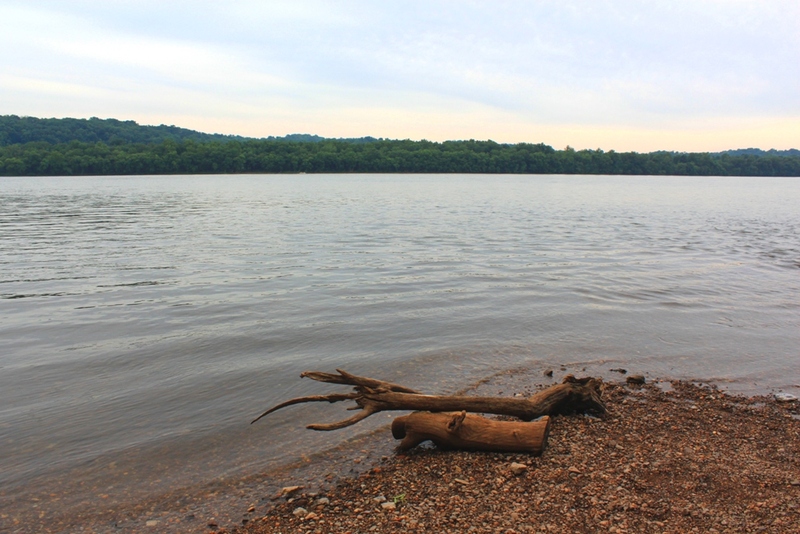 So I spent the early morning of July 4 down along the Susquehanna River looking for species of birds I should have seen back in April or at least in May. The good news for me is that I found several of those resident birds, and my 2011 list, while still paltry, has at least now climbed up out of the shameful category. So it was a successful trip, if not one that found anything unusual or even half-rare. It’s hard to find anything unusual or even half rare in July. Maybe next month when the shorebirds start to migrate. 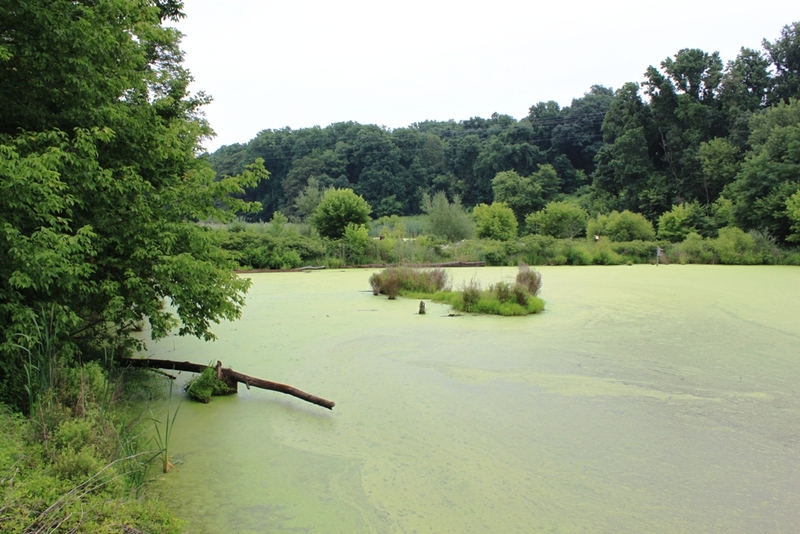 I visited Brunner Island in eastern York County, Pennsylvania, where I can see birds that like the river and birds that like the woods. Oddly, it was the woodland birds I found more of on this trip, not the river birds. 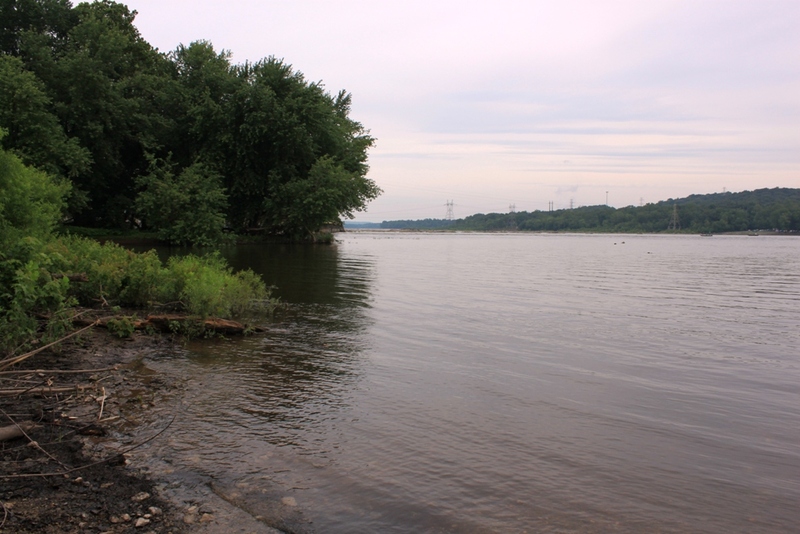 Brunner Island is land owned by a local power company, and birders and anglers have to contend with trains filled with coal holding up traffic or the release of water from the power plant. That said, the power company has also created boat landings and wildlife areas around the island, so a few obstructions are well worth the free access to the island and its environs. On this trip my best bird was apparently an osprey. I say apparently because when I went to enter my trip sightings in Cornell’s EBird, the site said I’d seen a rare sighting for July, which is almost laughably wrong. Ospreys are reasonably common in summer along the river, and last year in either July or early August I found a pair just a half mile south of where I saw this one. To my way of thinking, my best birds were two of the three species of swallows I found. Bank swallows used to be common river birds. They nest exclusively in tiny holes they make in a steep bank along a river. The power company has built the swallows a very nice bank in one area of their island. I didn’t see the birds in the bank, but I saw them not far from this spot underneath a railroad bridge. Three of them swooped about the spot with a larger group of rough-winged swallows. More than a few of the rough-winged swallows were the paler juveniles, which is always good to see. It looks as though these birds have had a decent nesting season. So with my little trip to the river, I feel like a real birder again, not some wannabe birder or a fair-weather birder (though the weather on this trip was fine). I just hope I can keep my birding up to par for the rest of the year!